Virginia Episcopal School Photo #2 - Faculty member and chair of the Science department Chad Hanning teaches a chemistry class. Virginia Episcopal School Photo #4 - Students and faculty enjoy time together outside on Box Plaza. Virginia Episcopal School Photo #5 - Many of our students are actively engaged in the arts, including the annual musical. Virginia Episcopal School Photo #6 - The Class of 2016 at Commencement. Our students go on to attend excellent colleges and universities across the US and abroad. Virginia Episcopal School Photo #7 - Our 2016 robotics team won the state championship. Virginia Episcopal School Photo #8 - We have a great community who loves to have fun together! We have exciting activities every weekend and throughout the year - from color runs to donut runs, sock hops to casino nights, the VES Oscars to movies on the lawn, end of summer and winter carnivals, and Asian New Year to Lessons & Carols. Come join us! Virginia Episcopal School Photo #9 - Jett Hall is the focal point on campus, where we greet visitors, hold classes, hang out in the day student lounge and hold study hall. Virginia Episcopal School Photo #10 - Langhorne Memorial Chapel is where our community gathers each week for assembly and chapel service. VES is an independent, coed, boarding and day school for students in grades 9 12. VES' mission remains true to when the school was founded more than a century ago-to know each student well and guide every child in their growth Toward Full Stature. Intentionally small with 260 students from across the country and the globe, the VES community develops well-rounded young adults-scholars, athletes, artists and confident, globally aware leaders-and delivers an exceptional experience offering the best teachers, innovative academic and co-curricular programs, and a vibrant, personalized learning environment. Virginia Episcopal Boarding School Avg. VES is an independent, coed, boarding and day school for students in grades 9 12. VES' mission remains true to when the school was founded more than a century ago-to know each student well and guide every child in their growth Toward Full Stature.Intentionally small with 260 students from across the country and the globe, the VES community develops well-rounded young adults-scholars, athletes, artists and confident, globally aware leaders-and delivers an exceptional experience offering the best teachers, innovative academic and co-curricular programs, and a vibrant, personalized learning environment.VES is a safe place in which students and faculty learn to live together with purpose and accountability. Through our four-year, progressive Student and Residential Life Program, VES faculty and outside experts address the challenges teenagers face today, leveraging the latest science about the adolescent brain. Through this program and others-academics, character and spiritual development, advisory, athletics, the arts, and service learning-students engage in real conversations, acquire practical tools and learn how to live happy, healthy, productive lives. And when they graduate, students have the competencies and confidence to go out and take on the world. 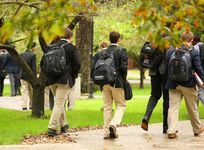 Our success is reflected in both the great kids growing Toward Full Stature in our community and our 97% retention rate-one of the highest retention rates of boarding schools in the nation; the national average for attrition at boarding schools is 10.5%. VES has held steady at only 3% attrition over the past three years. The VES College Counseling program is cited by families as among the best. With a focus on helping students find their very best fit for college, our counselors support, educate and provide the necessary tools to help students and parents successfully navigate the complex college admissions process. VES graduates attend many of the world`s finest colleges and universities, including Stanford, UCLA, Cornell, Yale, Princeton, Columbia University, MIT, Wellesley, NYU, the U.S. Naval Academy, UVA, UNC-Chapel Hill, Duke, the College of William & Mary, Wake Forest, Harvey Mudd and Georgia Tech.Nestled on 160 acres in the foothills of the Blue Ridge Mountains, we take advantage of our spectacular location-minutes from a thriving downtown with music, arts, maker spaces, an extensive trail system, mountains, rivers and lakes, the nation`s only year-round ski slopes and much more! William B. Harrison, Jr. '62 - Former CEO of Chase Manhattan and Chairman/CEO of JPMorgan Chase. Lee M. Thomas '62 - Former Chairman and CEO of Rayonier Corp., former President and COO of Georgia-Pacific and administrator of The Environmental Protection Agency under President Ronald Reagan. Erksine Bowles '63 - Former White House Chief of Staff to President Clinton, co-chair of the bipartisan National Commission on Fiscal Responsibility and Reform under President Obama, and 10th Chancellor of the University of North Carolina. Paul Taylor '49 - One of the foremost choreographers of the 20th century, received National Merit of Arts from President Clinton, MacArthur Foundation Fellowship “genius award”. Paul Fulton, Jr. '53 - Chairman, Bassett Furniture Industries, Former President of Sara Lee Corporation and former Dean of The University of North Carolina’s Kenan-Flagler Business School. Jerrauld Jones '72 - Judge on Norfolk Circuit Court, former member of the Virginia House of Delegates, law clerk to the Supreme Court of Virginia, among the first African-American VES students. Hardy Cross Dillard '19 - U.S. Judge of the International Court of Justice at The Hague, former Dean of The University of Virginia School of Law, appointed to special court of arbitration by Queen Elizabeth. People that viewed Virginia Episcopal School also viewed these schools: Asheville School, Miller School of Albemarle, St. Anne's-Belfield School, Saint James School and Mercersburg Academy. Grades: 9-12 | 294 students 231.1 miles360 Asheville School Rd.